Carol Evetta (Pierce) Leslie beloved mother, sister, nana and friend passed away at the age of 71 at her home in Providence Utah on February 3, 2019 after being called back to her heavenly home. A visitation will be held Saturday, February 16, 2019 from 10:30-11:30 in the Relief Society Room at The Church of Jesus Christ of Latter-day Saints Ward building at 155 N 100 E Providence Utah and the memorial will start at 12:00 pm with interment to follow at Wellsville City Cemetery. There will be a luncheon to follow for friends and family back at the Ward building where the memorial was held afterwards. Carol was born in Riverside, California on February 5, 1947 to Robert Eugene Pierce and Alma Beth Carlberg she was the fraternal twin to her brother Charlie Q Pierce. She graduated from Norta Vista High School in Riverside where she participated in many school activities. Drama was one of her great loves throughout her life. Carol was also active in many other clubs in school. 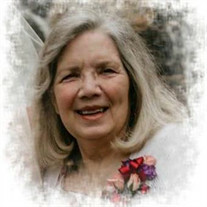 Carol joined The Church of Jesus Christ of Latter-day Saints in 1967 along with other family members; she continued to have an abiding faith and love for her Savior Jesus Christ as she remained a faithful member throughout her life serving in many positions, she especially loved teaching. Carol was married to Thomas A Leslie shortly after high school on the 30 October 1968, they were blessed with 3 children, they were later divorced. Carol loved to learn, she continued to expand her knowledge through education as she raised her family. She earned a B.A. from BYU, a Computer Programming and the Analyst Intern from RCC took graduate classes at BYU and earned a M.A. in Psychology from Pepperdine University. She passed on her love of learning to her children and many others. Being raised in the Navy she had the opportunity to live in many places and ever after had wanderlust and moved frequently telling her children it was an adventure every time they picked up and moved between CA and UT. She loved being a mother and spending time with her family. She especially loved being a Nana to her grandkids and spoiling them whenever she could. She had many talents and hobbies she was an excellent cook and talented artist in many mediums. She enjoyed being in her garden more than anything else and seeing the results of her labors. She was an avid reader and loved all kinds of music and enjoyed spending time in the beauty of nature. Her beautiful life will forever be cherished in the lives of her children Marinda R Leslie and Jeffrey T (Susan) Leslie. Siblings Bob (Rita) Pierce, Charlie (Julie) Pierce, Annie (Larry) Anderson. Grandchildren Megan (Tristen) Prazen and Kyle Leslie and her many other nieces, nephews, family and friends she loved. She is preceded in death by her parents and one child Robert Ryan Leslie and many others that have gone on before her. The family wishes to extend a special thanks to her nurse Monty and her aide Sadie and many others at PrimRose Hospice for their constant and compassionate care in her last days. The family would also like to thank the Fox Ridge Ward for their love and support. • I love to figure things out, diagnose, incorporate, analyze. • I love being creative sewing, painting, cooking. • The marvel of autumn the brilliance of the colors. • I love the comfort of family always understanding and acceptance knowing I’m not alone. My parents my children my brothers and sister. • I love the purity of small children, babies. • I love music jazz, blues, classical, Spanish guitar, flamenco, rock n roll, American southwest Indian flute. • I love scallops grilled with butter sauce, lobster, sole almandine, fillet mignon. • I would love to visit the Greek isles, Italy, Southern France and Spain. • I love the mountains the smell of pine the birds in the trees, warm days, cool nights and wild strawberries.